This dissertation situates historically a group of philosophical problematics informing a thread of post-World War II American music theory, begun at Princeton University under Milton Babbitt (1916-2011) and his students. I historicize and demonstrate the logics behind, without attempting to explain away, problematic notions from experimentalism to experience, solipsism to ethics. Initially a formalist project, Princeton Theory in the early 1970's underwent an under-discussed Turn toward experimentalism, seemingly rejecting its earlier high-modernist orientation. The dissertation situates this Turn as an auto-critique and provides a variety of hermeneutics for the Turn. I discuss how Princeton Theory before the Turn problematically situated itself as both a logical positivist or empiricist discourse, wherein musical experience plays a foundational role, and a formalist, conceptual, discourse, complicating the claim that Princeton Theorists were unconcerned with music hearing as such. Because musical experience seems to be personal, not sharable, I historicize Princeton Theory's uneven appeals to the notion of solipsism--that only the listening or theorizing "I" exists--and question this position's implications for ethics, arguing that Babbitt and his students have been more concerned with ethics and morality than their formalist commitments may imply. 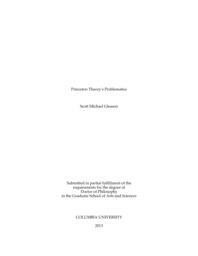 This dissertation offers a sustained discussion and critique of mid-century high-modernist formalism, raising the stakes of our understanding of this foundational discourse for modern music theory by showing its historical situatedness, contentious status even for the practitioners involved, and what claims it may still make on our own musical imaginations.